Black iPhone5/5s Brookley Phone SubliCOVER Case These cases have a full hard black rubber lining and a tough plastic overcase that holds the insert. Protective and stylish. 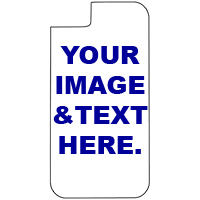 White iPhone5/5s Brookley Phone SubliCOVER Case These cases have a full hard black rubber lining and a tough plastic overcase that holds the insert. Protective and stylish.